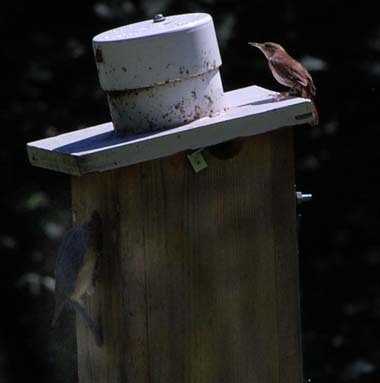 In recent years, house wrens have again posed a serious threat to the nesting success of other cavity nesters on our property, especially in the wilder areas. 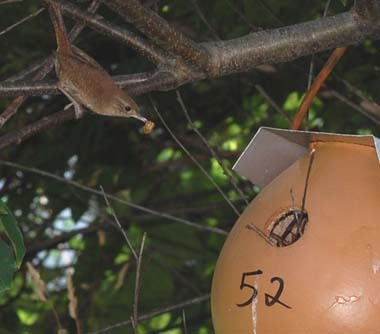 In 1992, I tested the use of small wren gourds to entice the wrens away from wooden boxes for titmice and other cavity nesters. While this trial showed promise, I hadn’t pursued it further until this year. 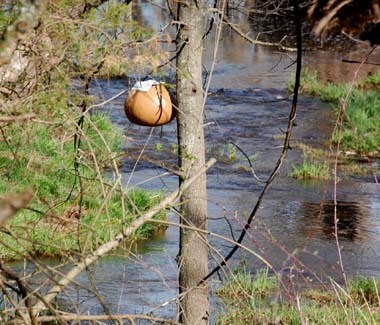 29 small gourds were placed in trees and large shrubs along overgrown fence rows and also near a small stream in a wooded area. The gourds were distributed rather randomly, resulting in overlapping nesting territories. This area always appears to be saturated with house wrens. They often use old downy cavities, as do bluebirds. 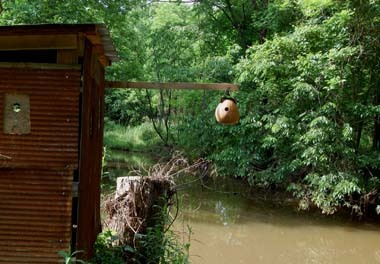 They also use several nest boxes placed along the creek on metal posts. 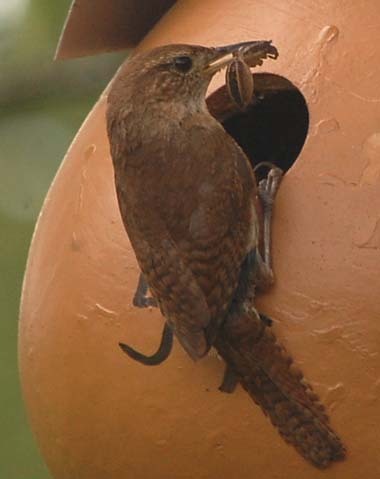 House wrens seem to be able to nest almost anywhere, so the extra gourds aren’t likely to attract even more pairs. However, it could increase their productivity – something I need to consider in the future use of gourds. The 29 small gourds varied in size from 55cm to 93cm in circumference. There was no difference in the wren’s preference for size as far as which gourds were used first. 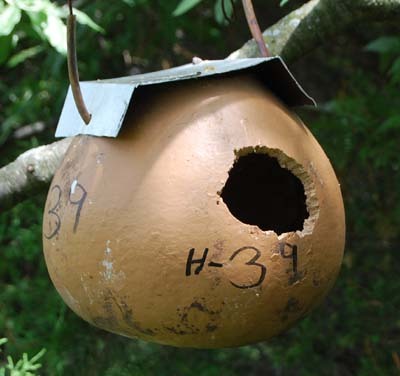 A 3” hole was made in the top of the gourds for easy cleaning and nest inspection and emptying of sticks. 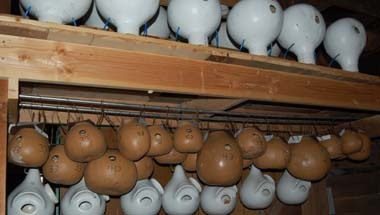 A brown stain was applied to the gourds since they will be used for several years. The roof of metal flashing was affixed to the top by running the hanging wire through the metal on either side. Running the wire through a short length of Tygon tubing prevented the wire from cutting into the gourd at the two drilled holes. At the end of the nesting season, all gourds were retrieved, emptied and hung in the barn with the martin gourds, ready for next year’s use. 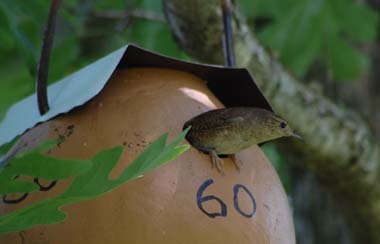 Of the 29 wren gourds placed, 27 had wren sticks added and 25 had successful nestings. The number of fledglings from each gourd was not determined, but only one unhatched egg was found and no dead nestlings were present in any of the gourds. 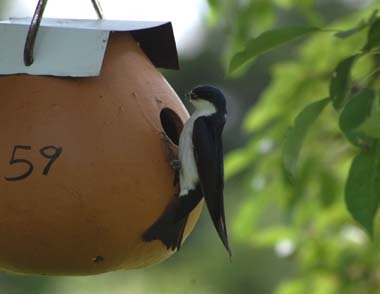 One of the two gourds with no sticks added was used by tree swallows who successfully fledged young. This was in a pear tree near a vegetable plot and not near any taller vegetation. The other unused gourd was hung under a low deck along the barn wall. This was the only gourd not hung in a tree or shrub. House wrens bring an amazing variety of insects and spiders to the nest. The only wren gourd to be used by another species was located in a pear tree by the front garden plot and not near any other tall vegetation. A pair of tree swallows chose this site because it was an adequate distance from another pair of nesting swallows. A box closer to the second pair was tried, but the bickering became too intense. Wrens nested at three different gourds within 100 ft of the tree swallows during the summer, but ignored this gourd. 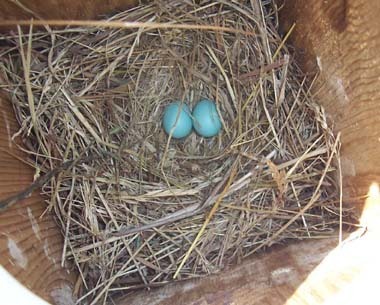 Two nest boxes in the only open area along the creek have been used by tree swallows and bluebirds for the past 5 years. 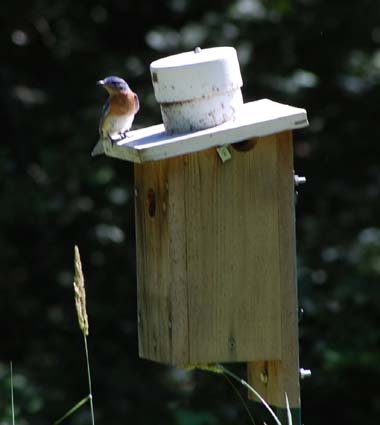 The tree swallows always used the box at the water’s edge and the bluebirds used a box set back 40 feet from the creek. House wrens had never interfered with these nestings. 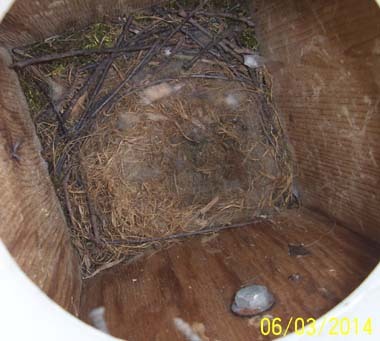 This year, the bluebirds had a first brood further down the creek in a Downy cavity and then began a second nest in their usual box. 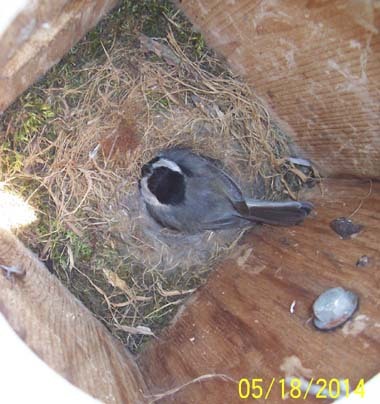 The tree swallows also appeared rather late and chickadees had already begun nesting in their creekside box. 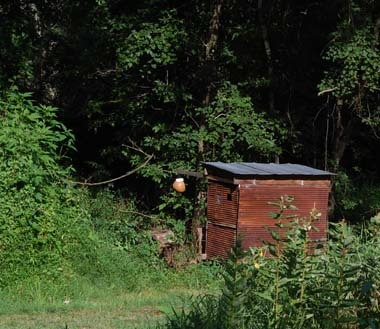 This would have worked out fine except that I couldn’t resist placing one of the gourds on the creek blind earlier, which is near both of these boxes. 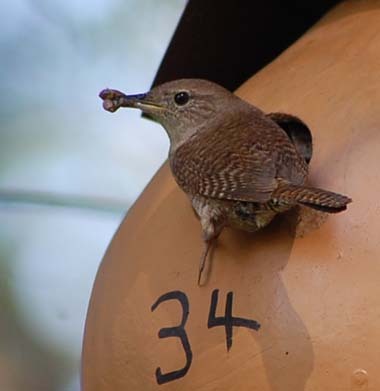 Wrens nested in the gourd, but, it wasn’t long before eggs were removed from the chickadee box and wren sticks appeared. 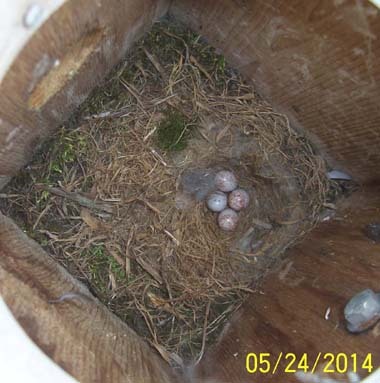 Then the first two eggs laid by the bluebird were pecked. Both nests failed. 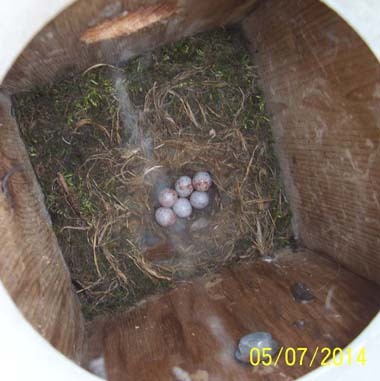 The wrens did not use either box but were observed entering both boxes. 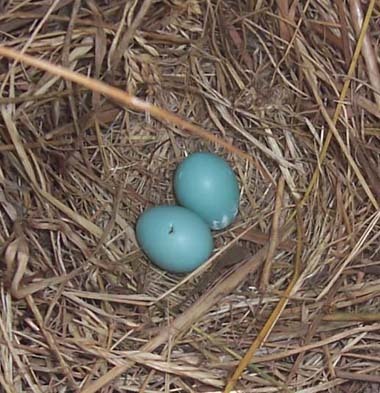 And, the tiny triangular holes in the bluebird eggs were unmistakably caused by the wren’s beak. Next year I plan to place the wren gourds in groups of three and space these groups far enough apart to encourage non-overlapping nesting territories along the same fencerow and creek area. 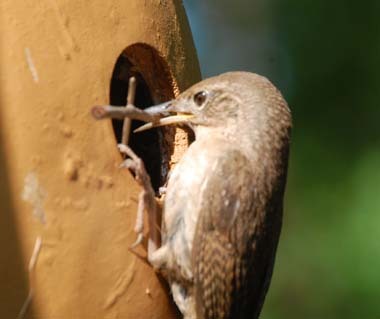 Why house wrens so frequently destroy the nests of other birds is unclear. While I haven’t witnessed this, others report that wren nest predation is not limited to nests in cavities. 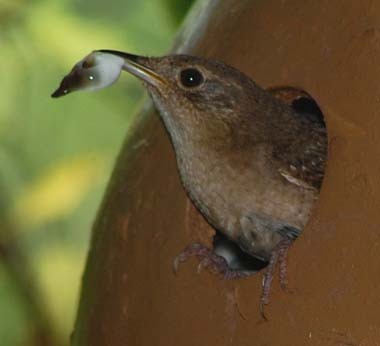 Destroying the eggs or young of open nesters would not secure nest sites for the wren’s use. But, perhaps destroying all nearby nests is a simpler evolutionary step. 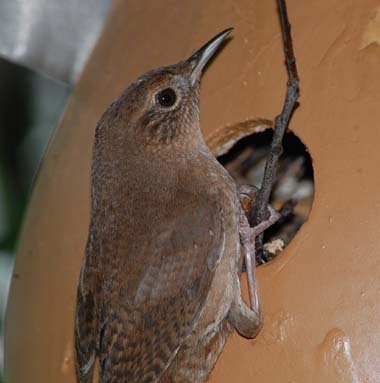 After all, pecking a few eggs takes very little energy and time on the part of the wren. 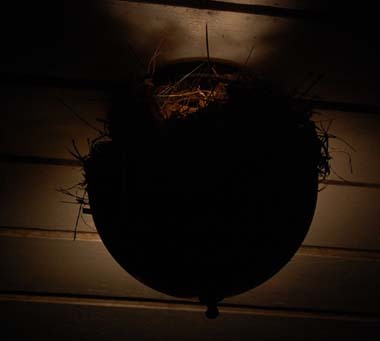 Ironically, while I was monitoring the 29 wren gourds, 4 of which were within 50’ of the front porch, wrens built a nest in the globe of the front porch light. We were unaware of this, since we use the backdoor. I turned on the porch light switch one night, for some reason, and it appeared that the bulb had burned out. Several minutes later the smell of burning grass wafted through the living room window, coming from a smoldering nest in the light globe. There had been so much nesting material around the bulb that I hadn’t noticed the dim glow on the ceiling above the globe when I turned on the light. The spaced boards on the porch ceiling would have allowed a fire to easily spread if it had not been caught in time. As I returned to find the smoldering nest, a wren flew out of the globe. Of almost 100 bulbs in our house and outbuildings, only 8 that are seldom used are still tungsten and this was one of them. It may be that dry grass tightly packed around a CFL would also eventually ignite. Simply removing the globe may be better. This year, the wren gourds were located in 8 groups of 3 gourds and one pvc nesting tube each. The eight sites were spaced out along Cattail branch and along an overgrown fencerow as in 2014. At least 30 meters separated each of the eight sites. In all groups but one, a gourd was selected for the first nesting. In group H, a tube was used for the first nesting, likely because all three gourds had an enlarged entrance hole. 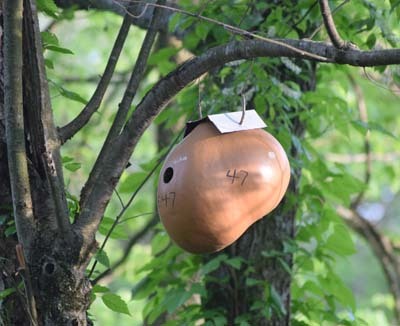 A squirrel had enlarged a gourd in this location in 2014, but not stored nuts, and was likely still present. 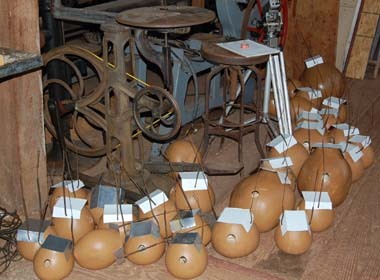 However, one of these gourds was used for the second nesting. 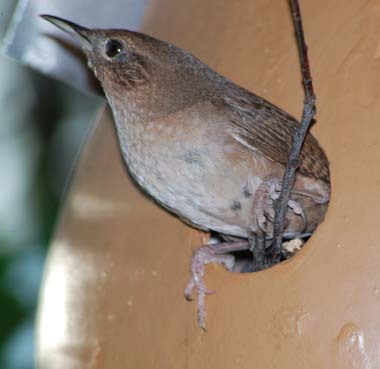 An enlarged entrance gourd was also used for the second nesting in group E. It seems that the house wren’s first choice is the natural gourd, but it has no problem using 4” pvc tubes if the gourds are visited by a squirrel or have greatly enlarged entrance holes. In autumn, when the gourds were retrieved, pairs of white footed mice were found in four gourds, but no young were present in the nests. A rodent nest was found in one other gourd. One of the gourds with adult mice present had a 1 inch hole gnawed near the bottom and opposite the entrance. None of the gourds, including those with enlarged holes, had any nuts or acorns stored in them. 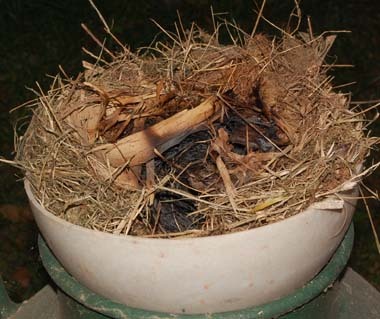 No white footed mice had used the gourds prior to the end of the wren nesting season. Also, no other cavity nesting species were seen at the gourds. The gourds were all less than 8 feet high. 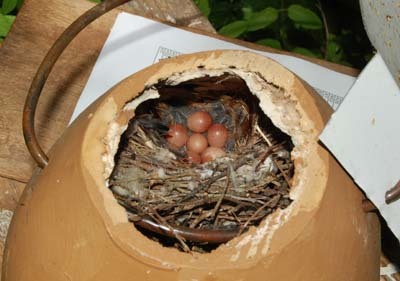 The only other bird species observed nesting near any of the wren gourds were two catbird nests and an Acadian flycatcher nest nest which was in the same tree and at a similar height. All three nested successfully. 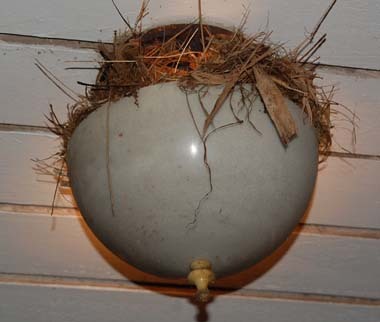 I even placed a blind very close to an active wren gourd nest to photograph the flycatchers. The two species ignored each other while bringing food to their young.